Two weeks ago, I announced Vermont's first-ever Sofar Sounds concert. In case you missed it: Sofar Sounds is an ongoing, branded concert series that takes place all over the world. Sofar events have a limited capacity and take place in unconventional spaces, and the lineups are kept secret until the day of the show. Given that I am a curious, adventurous kind of guy, I took the plunge and decided to see what all the fuss was about. Sofar announced the location on Thursday, the day before the show. So on Friday, ticket holders headed to Adams Apple Orchard & Farm Market in Williston. Specifically, guests were directed to a private residence near the farm market, which turned out to be the home of the orchard's proprietors, John and Peggy Adams (no relation to yours truly). I have to say, that's a pretty baller move — inviting a bunch of strangers to hang out in your backyard. Kudos for taking a leap of faith, Adams family. As I took a seat among the 40 or so people basking on the gentle slope behind the house, I was struck by the amount of gear that had already been set up in front of the dense grove of apple trees. I was expecting little to no amplification, given that Sofar shows tend to be stripped-down, acoustic performances. But what with the amps, mixer and various other pieces of tech — much of which Advance Music Center generously supplied — I figured that we were in for a more "suited-up" show. Indeed it was. Hinesburg-based singer-songwriter Justin LaPoint took the opening slot. He strummed out a series of acoustic folk-rock songs that he explained were mostly "about chicks." His intimacy and low-key energy was perfectly in line with what I anticipated from the series. Part of Sofar's mission is to bring drastically different artists to each show, and the contrast between LaPoint and the subsequent act was exactly that. 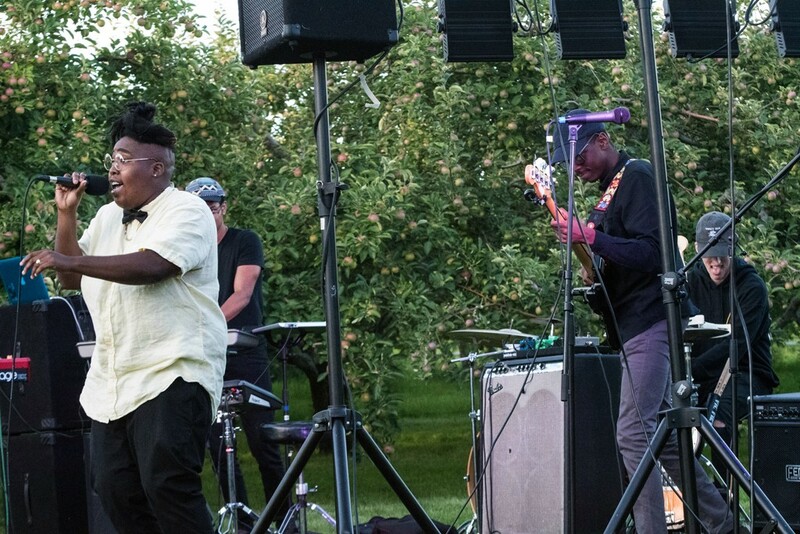 Northampton, Mass., queer hip-hop icon Billy Dean Thomas, along with her new band, delivered a smooth and invigorating set full of audacious rhymes, funked-up grooves, and plenty of call-and-response. Last up were Burlington's masters of unconventional spaces: Madaila. Amid their requisite cheeky repartee, the guys whizzed through highlights from their catalog and served up a delightfully faithful cover of Whitney Houston's "How Will I Know." And heads up: We're exactly one month away from Madaila on Main 2.0, their Nectar's-adjacent street festival on Saturday, September 2. And that sums it up! Vermont's first Sofar was a smash. Guests engaged with the performers, excess chatter and cellphone usage were minimal, and the overall vibe was convivial and welcoming. I'm stoked for the next installment on Thursday, August 17, location TBD. Visit sofarsounds.com for more information. If last weekend's Ramble in the Old North End left you hungry for more freewheeling, street-dancing shenanigans — because, for me, it surely did — you'd be wise to immerse yourself in Burlington City Arts' 10th annual Festival of Fools. From Friday through Sunday, August 4 through 6, downtown Burlington transforms into a circus-centric street fair with pop-up musical performances, outlandish theatrics, a killer block party and late-night after-parties. Though there are far too many happenings to name, definitely check out some of the following highlights (and check Dan Bolles' preview). Friday's Block of Fools Street Party is the place to cast off the shackles of your workweek. It gets going just around quittin' time and features rock-and-soul duo Coyote & Crow, Drumadics beat-and-brass band, folk fella Dan Blakeslee, eclectic vinyl overlord DJ Disco Phantom, local cumbia band Mal Maiz, and Caribbean-blues man Brushy One String, who, as his name suggests, plays a one-stringed guitar. 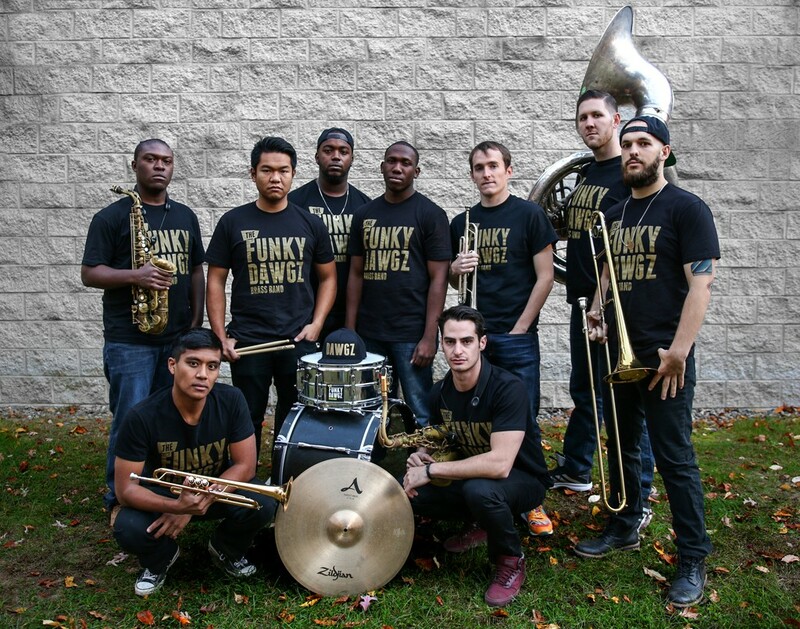 And, like any good after-party should, Nectar's throws it down big-time with sets from Funky Dawgz Brass Band and genre-bending, circus-punk band Bella's Bartok. Nectar's continues the tomfoolery on Saturday night with the always-energetic indie rockers Little Slugger and concludes with the dreamy, West African dub-fusion of Barika. But it might be best to just wander around and let your senses be your guide. After all, buskers galore will crowd the Church Street Marketplace. And, honestly, some of the most engaging things you're likely to encounter might not even be officially listed. So get out there and pound the pavement. Visit vermontfestivaloffools.com for complete info. A prominent member of Burlington's music community is the subject of this week's Daily Grind at the Vermont Comedy Club. On Thursday, August 3, Waking Windows' Brian Nagle — aka DJ Disco Phantom — will regale the audience with stories from the first jobs he ever worked. Then the club's long-form improv troupe, the Unmentionables, will spin those tales into comedy gold. Trust me: Hilarity always ensues. Attention, bowling and rap enthusiasts: On Friday, August 4, Burlington's hip-hop dream team Cultural Chemistry and Windsor's all-star crew Maiden Voyage descend on Champlain Lanes in Shelburne for Bowling for BP. The event benefits the Ryan Morin Memorial Scholarship, which was created in memory of the late DJ and rapper BP of the Aztext and Unkommon. Morin passed away in the spring of 2016, and the scholarship was created to send one lucky camper to Camp Dudley at Kiniya, the all-girls summer camp where he worked as a counselor. In addition to the aforementioned hip-hop performances, Morin's father, Wards drummer Rick Lincoln, and his punk band Def Con 3 reunite for the first time in many years. Mac Demarco, "For the First Time"